Drafted October 15, 2017. Updated Sep 16, 2018. Before Slack, my girlfriend and I used a combination of iMessage / SMS and email. We found we didn’t know where some detail was kept and did not have a good way to search on multiple platforms. While we both had WhatsApp, WeChat, Instagram, and Facebook messengers, they were somewhat overloaded with other messages. We are two New Yorkers with different work / social groups. These groups have shifting priorities and place constraints on our time. We found it difficult to stay in touch and in sync while on the move. It was not in New Yorker, though it was delicious. From a trip to the New York Natural History Museum. A year ago, I started using Slack at work. Slack was a replacement for a few enterprise messaging platforms 1 and I found Slack solved many knowledge and communication problems. It is searchable and allows discussions to be organized into topics (with channels, detailed below). Slack has web/mobile/mac applications and confirms if messages are delivered. 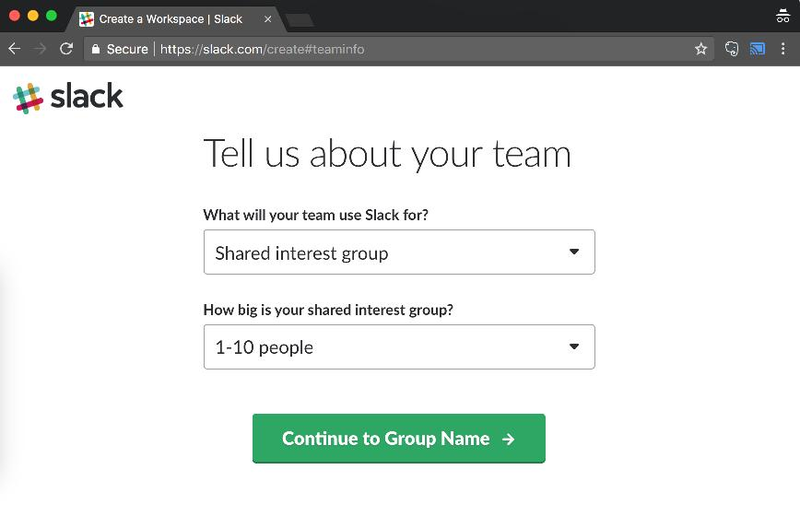 Slack also integrates many other platforms 2. 🔑 Relationships are just another form of organization. We started to experiment with moving our communication to Slack and found good use cases (e.g. taking care of our cat, which I’ll describe later). We started off by agreeing this would be a hypothesis and we would likely get all the conventions wrong at first. If we felt this was not working or was too burden-some (what comes to mind when I say “enterprise messaging”), we’d stop. #travel for planning travel (we’ve been using TripIt for organizing boarding passes, AirBNB/hotel and car reservations, etc.). Our communications were a bit chaotic at first because we posted a lot to #misc. Since then, we’ve been gradually adding more channels for concrete topics (#cooking, #ops, etc). I imagine John Wooden would love talking with modern health behaviorists / digital technologists about how to use technology to help with little details. We now do our best to share detailed messages, using Slack as a external brain, even if the contents of the message do not directly affect the other. Placing these little details in Slack helps coordinate what needs to happen now, and allows us to search for these details in the future. #misc @f: “Hey, I’m planning to head to K-Town for dinner. Would you like anything from the market?” → Haley messages me and I buy a delicious savory pancake from Woorjip (a Korean market in Manhattan). #ops @h: “I’m going to do laundry this evening. Is there anything you’d like washed that isn’t in the laundry bag?” → I message about an outfit I had left in my bag. Haley finds it to machine wash.
After a month, we discovered we had shared to-do list items, and thought to try out a Slack todo list (“todobot”). We could type “/todo @f "Sand down wood block" Saturday 9 AM” in #home-projects. We would get reminded on Friday that this was due. This made regularly occurring tasks easier to schedule and to remember (e.g. “/todo clean the house weekly”). These tasks could be completed by either of us. When one of us marked the task as complete, we would both be notified it was completed. We could also say “Alexa trigger Claude food” that would notify both of us in Slack and record this data in Google drive. Deep dive! Before dating Haley, I had not lived with a cat before. Then, Claude moved in in June. 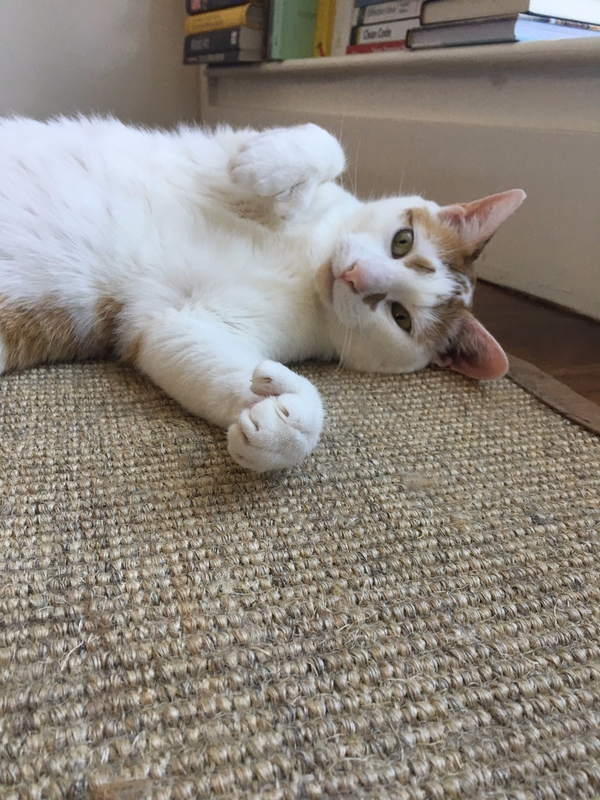 Claude is a unique creature who loves chasing imaginary bunnies, watching TV, and using his paws to open doors. Fun photos of cat antics. Notifying each other regarding regular ops. We share food / play to this channel and collect this data in Google Drive (see below). We collect this data by sending an SMS using Workflow (a one-click SMS sender). IFTTT interprets this SMS to post the information to the #claude channel. With our busy schedules, this helps us make sure that Claude has been fed breakfast and dinner each day, and that he doesn’t trick us into doubling up on one of his meals. Developing hypotheses. We talk about experiments to try to make Claude / our lives happier. Claude has been pulling out fur for a while (we know he’s been getting over a fear of large windows) and we’ve been testing ways to help this. We also recently installed an automated dry-food feeder / water faucet / toys, all of which seem to help. Data collection for eventual analysis. As we feed and play with Claude every day, we use the Workflow mentioned above to collect information on feed and play times in Google Drive. We also collect behavior information with this same medium. In addition to posting to Slack, IFTTT interprets this SMS to append a pre-formmated row to a spreadsheet in Google Drive. We hope to use a combination of daily data points, hypothesis testing, and behavior to see if there are behavior trends upon testing a new hypothesis or feed / play data points. 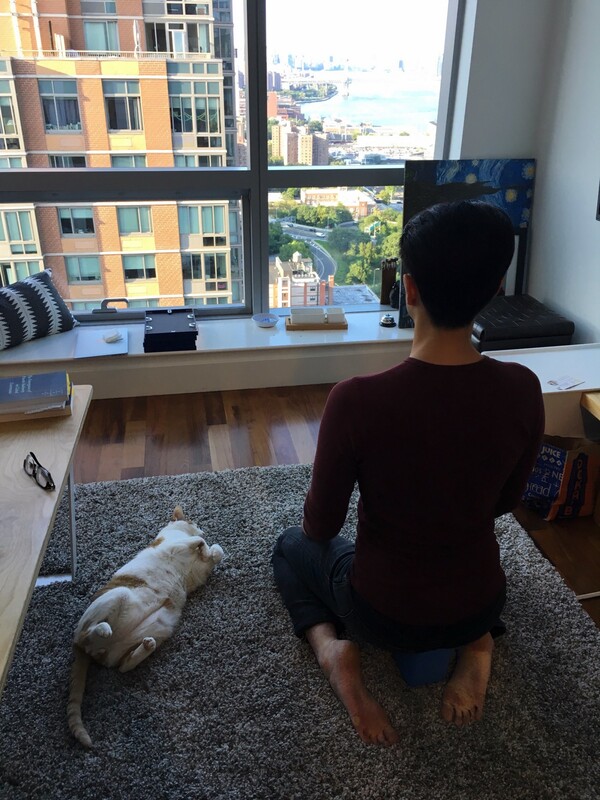 @h: "Meditation bros." When I sit down to meditate, Claude often sits down next to me and joins. @h: "The squirrel hunt is on!" Claude trying to figure out where the squirrels are when we play Cat TV. This was a surprise when I was looking at how we used Slack together. We got a lot more organized without either 1) suffering miscommunication or 2) needing extra apps for complex planning. E.g. while there are many collaborative to-do lists, we did not need to install an extra application on our phones by using an integration. For example, we incrementally built on a “guest resources” Google Doc for friends / family when they stayed our place. This guide started as post-it for the wifi network. We slowly added more, such as things to know to navigate the neighborhood / home (like where to park or how the automated blinds work). In the past, this might be information that we would tell people individually by text because we forgot to mention it earlier. We had an easy way to add missing items to this resource guide. We had a central place to plan for when people joined us. We pinned this doc to be able to find it easily. (So we can let the machine remember and we can forget it.) Slack has become an external memory and trigger for us. 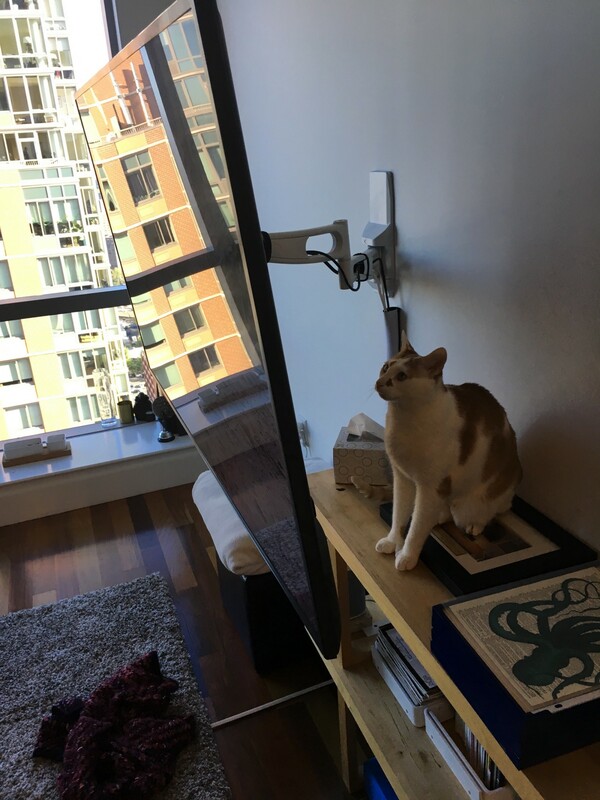 When writing this up, I looked back at our Claude threads and found many hypotheses we’ve tested for cat behavior training, food choices, and general well-being in Slack. For example, we could make notes of food that the cat did not enjoy, which informed future choices. Our relationship feels new and interesting as we discover ourselves and each other. I feel delighted when reading the threads we shared on cat / dog memes, news articles, books, places to explore, etc. I make about 80% of the posts in #home-projects, while Haley makes about 80% of the posts in #cooking. We both found this heteronormativity interesting - these are two areas we separately do and jointly enjoy. I love building home projects and she loves baking desserts. We found this sharing to be an authentic, non-invasive way to share the details of how some experience is put together, whether it’s a wiring diagram for our Alexa-enabled three-switch lights or a recipe for spinach goat cheese quiche. We continue to use and enjoy using Slack. This technology has been a fun addition and communication-compounding addition to our relationship. We use it for areas that machines excel at and humans do not excel at - e.g., recording data perfectly / reminding us about this data - and we expect our usage to evolve in the future! If anyone out there uses enterprise messaging for their relationship communications (or starts to do so after reading this), I’d love to hear from you!